We can supply a wide variety of special features to add to your event. Whether your event is formal or casual, indoors or outdoors, special features will make your event unique and memorable. For outdoor summer corporate events we can provide: virtual hang gliding, golf simulators, rock climbing walls, massage therapists, music DJs, live bands, and much more. For family events we can provide: games for kids and adults, face painting, relay races, carnival rides and concession stands; just about anything you can think of. 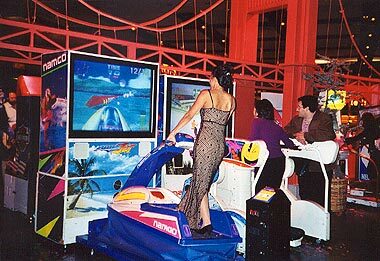 For indoor parties and celebrations we can provide: video arcades, live music and entertainment, character actors, unique performances such as acrobats; all from one source! Additionally, we will of course provide customized menus and buffets for your group, decor and ambience, waitstaff and everything else you need to complete your event. For an event that will impress, we'll meet with you to discuss the options. A video acrade was added to this formal San Francisco themed party. 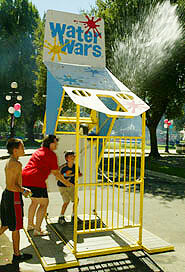 Water wars are fun for summer events. A grand performance by dancers at a formal event. 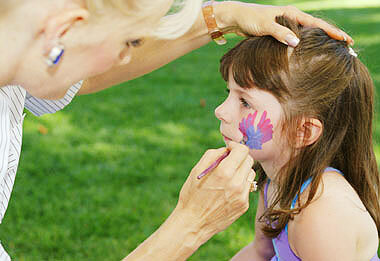 A facepainter at a family event is fun for the kids. 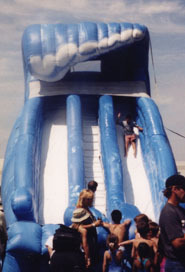 A giant inflatable waterslide is a great addition to a beach party. 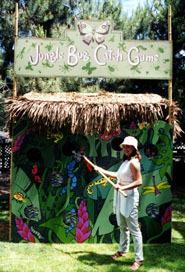 A variety of carnival games can be customized to match your event theme. 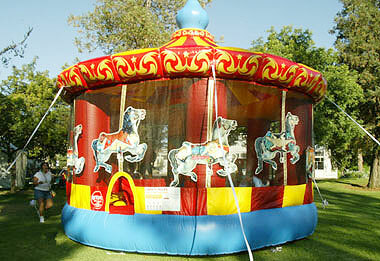 For family events, bounce houses come in a variety of themes. See the Special Features you can add to your event!